This article describes some of the recent changes on Google+ pages, which made it possible for Google+ page owners to set up a log in and a Gmail account for their Google+ pages. 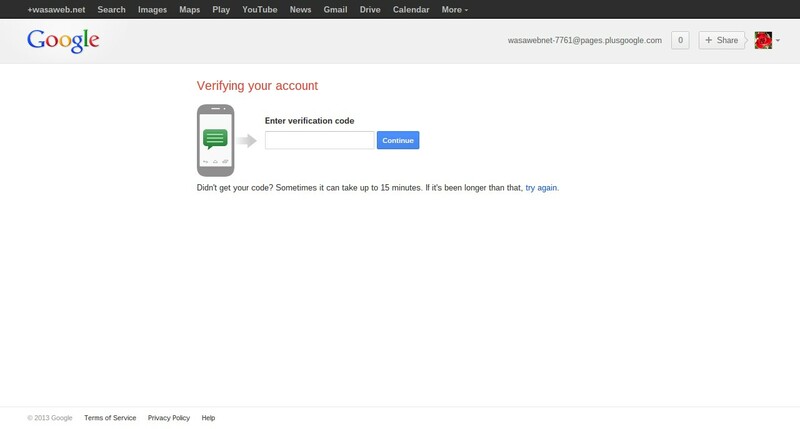 Please note that information contained in this piece is based on creating a log in and a Gmail account for a Google+ page on 7 February 2013. The reason I called the new set-up semi-independent is because a Google+ page must still be owned by an active Google+ profile, hence deleting the Google+ profile that owns the Google+ will result in the deletion of the latter. In other words, Google+ pages are not a self-standing product. It also remains the case that, for example, if a Google+ page for a business or an organization is owned by the Google+ profile of the person who is responsible for social media engagement, and that person leaves for another post, then the ownership of the Google+ page ought to be transferred to the Google+ profile of his or her replacement. According to the document mentioned above, the new owner will have to repeat the same process, though the username for logging into the Google+ page will remain the same. The changes resolve some of the problems that have been apparent with Google+ pages, such as not being able to use Google+ pages without a Google+ profile, the limit on the number of managers, and the inability to appear as Google+ page in the hovercard (the small pop-up that appears as you hover over someone’s name or e-mail address on Gmail and Google Apps e-mail accounts) in e-mail correspondence, even if the e-mail alias had been set to the name of the business or organization. This may further facilitate in linking Google+ pages to other Google entities, such as YouTube and Blogger, in the future. It is important to note that if a specific Gmail account for a Google+ page is created, then that Gmail account is tied to that Google+ page alone. In other words, the Gmail account tied to the Google+ page will be deleted, when the Google+ page is deleted. However, deleting a Google+ page and its Gmail and Google account will not impinge on the Google+ profile or Gmail or Google account that owns the Google+ page. 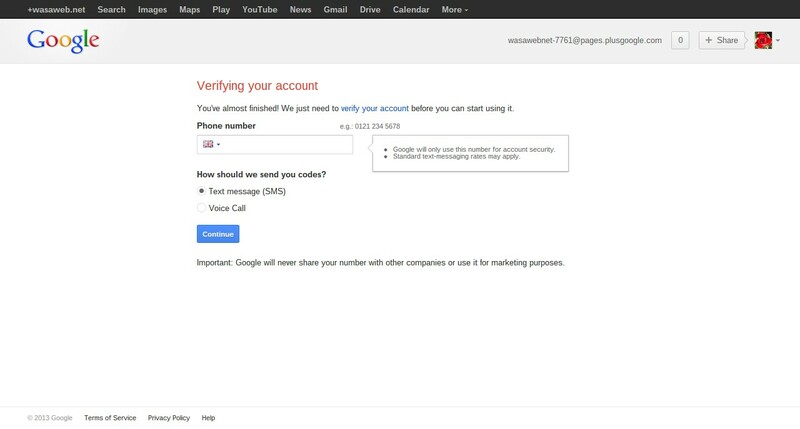 In order to create a separate log in and Gmail account for a Google+ page, you will need to sign into the Google account, thus the Google+ profile, that owns the Google+ page. Click on the Google+ pages tab, and switch to the Google+ page for which you would like to create a log in and a Gmail account. Go to the settings page, and scroll down until you find Third-party tools, and click on Set up a password. 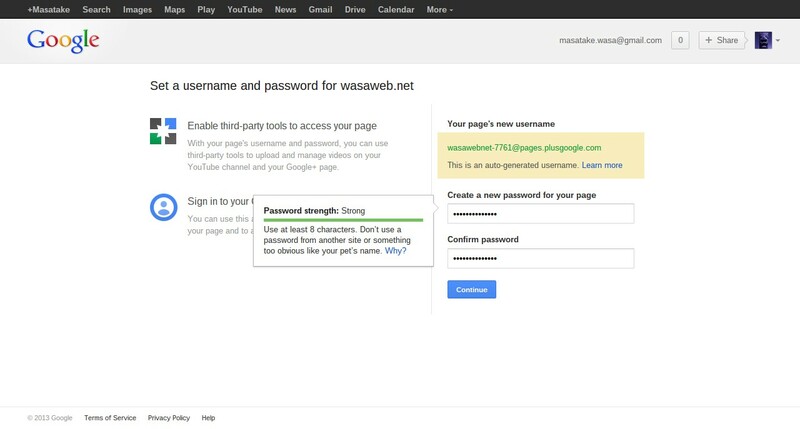 When you click on Set up a password, you are taken to the following page, where you are prompted to create a password to log in to your Google+ page directly. At this point, the username is automatically generated, and it cannot be changed. 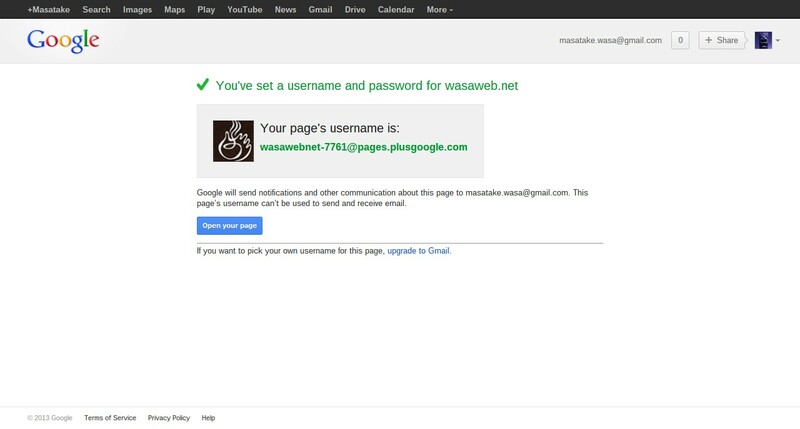 A new log in with the e-mail address wasawebnet-7761@pages.plusgoogle.com has been created. By using this automatically generated e-mail address and password that has been set at the previous stage, people do not need a Google+ profile or have to be a manager, in order to log into Google+, and act as that page, by for example posting on the stream. However, in order to create a custom username, it is necessary to click on upgrade to Gmail. 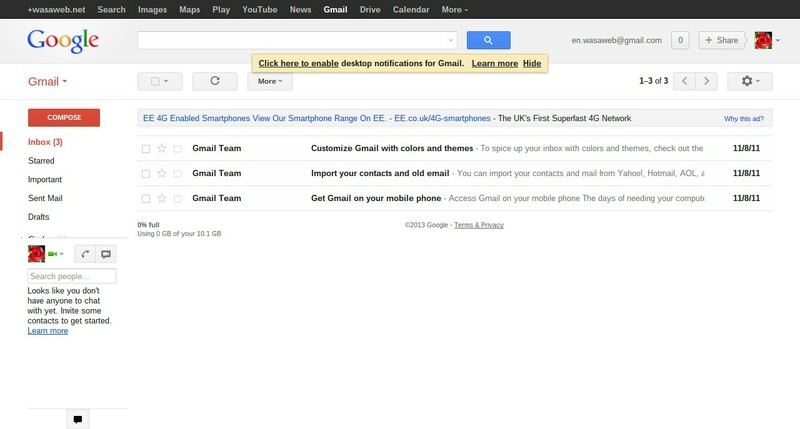 Once a Gmail account is created, the hovercard will show the details for that Google+ page, when the e-mails are sent from the Gmail account for the Google+ page. 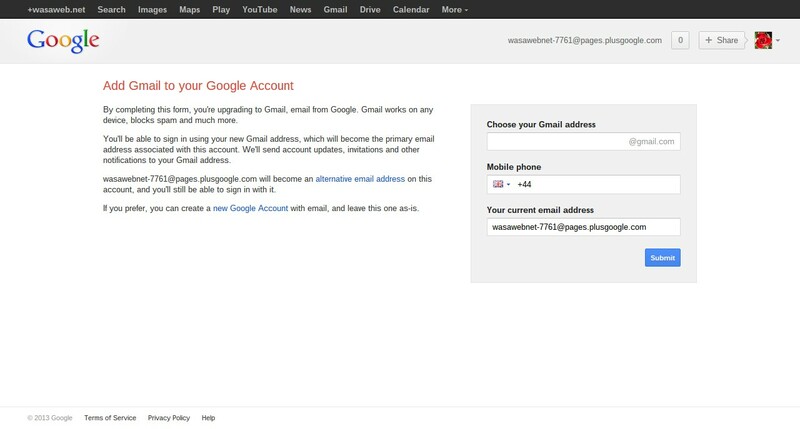 You are now creating a Gmail account for the Google+ page, and you can choose your username, the section before @gmail.com. In my case, I have opted for en.wasaweb. You are asked to verify your account: I chose to receive a text message on my mobile phone. The process is now complete, and the e-mail address displayed at top right is the username I have chosen for my Google+ page (en.wassaweb). Now I can send and receive e-mails as my Google+ page, rather than as me as represented in my Google+ profile. While this may cause some confusion, given a number of different ways to access the Google+ page with editing powers (as the owner or as a moderator through the Google+ profile tab, or as someone who has been given the username and the password and directly signing into Google+), these changes should make Google+ pages a more versatile product. Note: I have created a log in and a Gmail account for a Google+ page that is owned by a Google+ profile with an @gmail.com address. For this reason, I have no idea whether the same can be achieved with Google+ local, or for a Google+ page owned by a Google+ profile on a Google Apps account.